In our second blog post Katie Aston discusses her experience of attending the Sunday Assembly in London, and reflects on the broader issues of nonreligious community, ritual action and meaning. 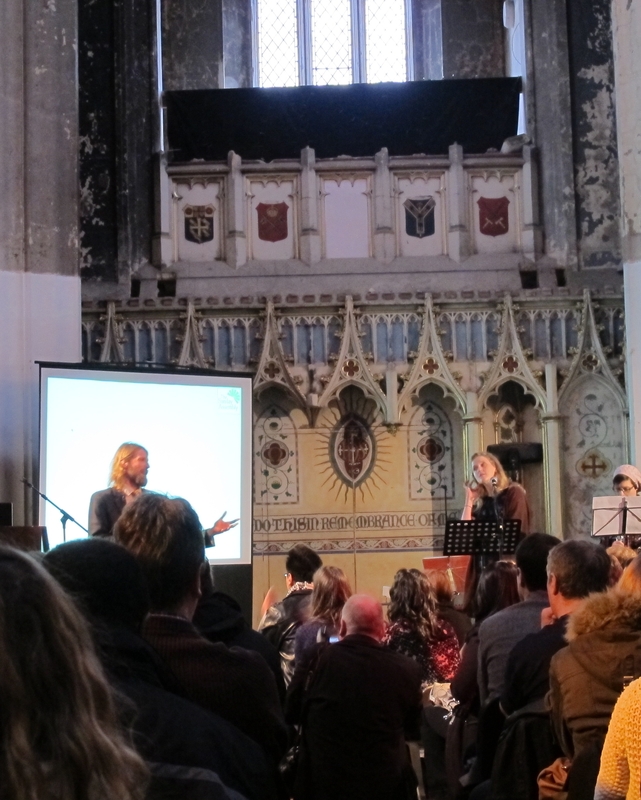 In February and March 2013 I attended the Sunday Assembly ‘sessions’ (or ‘atheist church’ as it has been labelled) held at The Nave, a deconsecrated church in North London. As the daughter of a vicar, a non believer and a researcher into the question of non-religious and secular practice in the UK, there were more than a number of reasons for my being curious. As this is a research blog and the internet is littered with appraisals of the Assembly; the good – ‘it fulfils a human need for community’ -and the bad – ‘how can an atheist call it a church, when there is no god or worship?’ – I will instead focus on a number of interesting questions I consider worth engaging with. My own research takes place under the umbrella of Anthropology and therefore, emerging non-religious practices such as the Sunday Assembly are perfect research material; you can participate and you can observe. At my visits I have to say I have done both in varying measures – as the child of a vicar, whose voice was loudest from the front row of pews, I do enjoy a sing-song. At the Sunday Assembly, while we are having a 2 minute silence, I cannot help but feel I am observing and not participating. But how, when I am silent in this period just like the others, am I not participating? How can I know if anyone is participating in the ‘silence’ in a meaningful way and why do I assume there is a difference? What can we say people are contemplating in an atheist silence? We might assume from the set up (based on the monthly themes such as ‘Wonder’ or ‘Helping Others’) that people are contemplating their worldly views on the subject in hand? But in this setting is there a ‘supposed to’; a directive? I have written on the Religious Studies Project site about the ‘insider/outsider’; both in reference to religion but also as a methodological consideration in general. My next question would be to what extent the Sunday Assembly will and does replicate the Anglican Church in space and provision, since collective memory of this community precedes it. Fellow anthropologist Lorna Mumford, who also attended the assembly in February, remarked ‘I think I was most struck by the social codes at play. I know from conversations with Sanderson Jones (one half of the duo who set-up the Assembly) that they deliberately chose to mimic the church service format because it is easier to engage people in something familiar than develop a whole unique context, but it seemed everyone present was knowledgeable enough to follow this cultural frame. No one questioned standing up to sing, and I noted that at one point when the organisers didn’t instantly tell them to sit afterwards people ‘bobbed’ unsure whether to sit or remain standing – demonstrating concern for following the ‘right’ convention’ (personal communication: 2013). Much of the replication of ‘church’ in the Sunday Assembly service seems to be done through the lens of memory and suggestion: a joint endeavour. In the weeks between ‘services’, Sunday Assembly Twitter and Facebook feeds offered an opportunity for people to suggest their own favourite flavour of church styles and practices, to be included into the pick ’n’ mix service being created. ‘What about the giving of the peace?’ one member of the congregation suggested – ‘Yep!’, and that went into the next ‘session’. Other replication comes of necessity; the collection plates (or rather coffee tins) were passed around for tea and biscuits– and yes, typically some of the money was destined to fix that pesky roof! So how does this use of cultural reference play out and how does it work for attracting nonreligious people from minority groups who may be unfamiliar with such references and social codes? Mumford and I both noted the disadvantage of this approach in welcoming those who have rejected this format, perhaps with negative memories of the institutionalised forms of religious practice. Then there are those for whom this is not familiar at all – someone of any other, or no, faith background. The assembly also poses a larger question that the nonreligious movement (if it can be called that) has been asking its self. Do atheists need a community? Shared practices? A space to commune? There are of course historical examples of this, such as Leicester Secular Hall which is still in action. Maybe we need to broaden the question: What purpose does a shared space serve and why does a need for community translate into a ‘service’ or ‘session’? There is a possibility that people view this practice, much as with other communal practices assumed to be the domain of the religious (funerals/weddings), as being reclaimed. These practices are human, but they pre-date a ‘Christian monopoly’. As Alain de Botton asked in Religion for Atheists (2012) – should we exclude the good bits of religion just because we don’t believe in its central tenets? So what do we keep? The arts, the beauty, the ritual? Yes, but what of the “out there”. The ‘bigger questions’? What are new cosmologies? And what and who are Sunday Assemblists gathering for. Awe and wonder can, and do, have a place in the lives of the congregation, without God. Place and purpose in the world fulfilled by the interaction with other humans and explained by the revelations of science – albeit offered in layman’s terms. Enchantment may now be secular (material) but it has not gone away (Saler 2006). In their book, What Matters? Ethnographies of Value in a not so Secular Age, Bender and Taves state that ‘Religion, Secularism and Spirituality become markers of value, as much or more so than they are containers of distinct kinds of actions or ideas. Positively, these terms may mark things, ideas and practices as self-evidently meaningful or link them with “higher”, more expansive aims. Negatively…they are marked as over-valued or wrongly linked to higher aims’ (2012: 10). The assembly implores us to Live better, Help Often and Wonder more. Wonder is a value in these terms. The cosmologies of religion are negatively marked – it is the wrong answer to the question of the out there: it does not explain, it cannot be proved. Wonder on the other hand, is the mark of the secular – allowing us to ask questions, move forward, and access truth. It is significant that the founders of the Sunday Assembly are both stand-up comedians. This fact does not go unnoticed by Sanderson whose role seems close to that of the compère; in the February session, Sanderson joked of his inability to remain silent in the period of reflection, silence being the fear of the performing comedian. A further question hanging in the air, is whether it could be replicated without his charismatic style? Yet the desire for replication is there, Sanderson proclaimed proudly in the March ‘session’ that there had been at least 200 requests to start a similar event, from around the world, and Glasgow and Melbourne are next on the map. So the ultimate question – where next for the Assembly? Katie Aston is Deputy Editor of NSRN Online. In 2006 Katie completed her BA (hons) in fine at Wimbledon School of Art in 2006. She went on to complete her Masters in Social Anthropology at Goldsmiths University, with a dissertation investigating gender performance within contemporary Stand Up comedy in London. Katie is currently undertaking an ethnographic study of non-religious value construction and material cultures under the supervision of Dr. Emma Tarlo and Dr. Mark Lamont at Goldsmiths University, London. She has also worked on the Moroccan Memories Oral History Project and in an educational and front of house capacity at the Tate Gallery in London. This entry was posted in NSRN Blog, Reflections from the field and tagged Atheism, community, Katie Aston, nonreligion, ritual. Bookmark the permalink. Thanks for this interesting post. I went along to the Assembly twice, mainly to find participants for my own research into the mystical-type experiences of atheists. When I went to the meeting in Bethnal Green in July, the hall was full to overflowing, possibly about 600 attendees, but two months later the hall was only half full. This may be because of the time of year, but there are probably also other reasons. At the July meeting I went inside for a while to see what it was like. One of the things that struck me was the predominance of women and couples with young children. This is quite a different demographic from most atheist organisations, and may reflect a desire for this group to form stronger social non-religious communities for their families. The songs I heard while I was there were ‘Always look on the bright side of life’, and ‘Bring me sunshine’. I found that disappointing. Although they are cute songs, they are hardly the type to unite and inspire a congregation. Most importantly, they are not the kind of songs that make you want to travel across London on a Sunday morning to repeat the experience. The Sunday Assembly is an idea with potential, but I suspect that if it is going to survive it will have to change its content considerably in order to engage the congregation and make it a meaningful experience. Incidentally, I found the people who were most interested in my research turned out not to be atheists. They had just gone along to see what it was all about. I also attended the Assembly on a few occasions as part of my research. Like you I noted the presence of quite a few children, very different to the other groups I work with who mainly meet in pubs after work. Although I also noticed that – in line with my admittedly limited experience of attending Christian churches – they often seemed to be quite fidgety and bored. At one session I attended a young boy also gave a reading from a Spike Milligan poem, which fits with your assessment that they may be trying to build a more family-friendly social environment for nonreligious people. I found your response to ‘Always look on the bright side’ interesting. On one occasion I attended the Assembly with some of my research participants from an atheist group. They were not very keen on the format, or the ethos, of the Assembly – but they did wholeheartedly join in with singing that song. Monty Python, I have found, is popular with a diverse range of nonreligious people. I was asked by a friend to check out a Sunday Assembly here in Melbourne, but demurred. It sounded terribly dull. Here, people are re-inventing church ritual in a radical way, to make it meaningful to them. In so doing, these young Christians to seem to be engaged fully in the spirit of Enlightenment humanism: that our circumstances are of our own creation; that we shape our own future; and that there is nothing in tradition that is not open to questioning and transformation. On the other hand, the Sunday Assembly, in its attachment to “traditional” rituals, seems to reflect more the spirit of a conservative church. Ironic. And to tell you the truth, as a 57 year old atheist, I’d be far more inclined to engage in the ritual developed by the young Christians, than in the Sunday Assembly. The Sunday Assembly format seemed to me much more an appropriation of traditional Christian forms of ritual – re-packaged in a nonreligious way – rather than a unique creation; although my understanding is that this is deliberate. As one attendee explained it some atheists were feeling that they had ‘thrown the baby out with the bathwater’. And of course, we can compare it to the ethical churches of the 19th century which in many ways were very similar. I also found that the tradition, and proscribed format, of the Assembly wasn’t popular with members of another atheist group I was conducting research with. However it does seem to be currently enjoying great success. The services I attended were packed out, and there are now a number of other Assemblies (running or planned) around the UK and in a quite a few other countries.